In order to begin an investigation into a leak of classified information, the Justice Department asks the agency that classified the information to answer this series of 11 questions. FRONTLINE received this document as the result of a Freedom of Information Act request. 1) Give the date and identity of the article disclosing the classified information? 2) Give specific statements in the article which are considered classified and whether the data was properly classified? 3) State whether the classified data is disclosed accurately? 4) State whether the data came from a specific document and, if so, the origin of the document and the name of the individual responsible for the security of the classified data? 5) Give the extent of official dissemination of the data? 6) State whether the data has been the subject of prior official releases? 7) State whether prior clearances for the publication or release of the information was sought from proper authorities? 8) State whether the material, or portions thereof, or enough background data has been published officially or in the press to make an educated speculation on the matter possible? 9) State whether the data can be declassified for the purpose of prosecution, and, if so, the names of the person competent to testify concerning the classification. 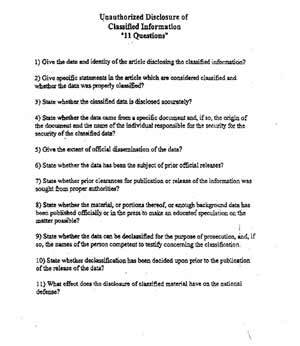 10) State whether declassification has been decided upon prior to the publication of the release of the data? 11) What effect does the disclosure of classified material have on the national defense?